Christine Michelle Metz (born September 29, 1980) is an American actress and singer. She is known for playing Kate Pearson in the NBC drama This Is Us, for which she has earned Best Supporting Actress nominations at the Primetime Emmy Awards (2017) and Golden Globe Awards (2017 and 2018). Metz was born to Denise and Mark Metz in Homestead, Florida. She spent her formative years in Japan, where her father was stationed. The family later moved back to Gainesville, Florida, where she attended elementary, middle, and high school. She grew up with her mother, stepfather, two siblings, two half-siblings, and her dog, Jack. Metz is best known for her role as Kate Pearson in the NBC drama series This Is Us, which earned her Primetime Emmy Award and Golden Globe Award nominations. She is also known for her role in FX's American Horror Story: Freak Show. Metz is a singer in her band Chrissy and The Vapors. In early 2018, it was announced that Metz would star in Breakthrough, working with producer DeVon Franklin. She is cast as Joyce Smith, the mother of John, a 14-year-old boy who fell through an icy Missouri lake and was proclaimed dead. The movie, based on the book written by Smith herself, tells the story of how a mother's devotion and dedication brings her son back to life through prayer. Metz studies with acting coach John Kirby. On January 5, 2008, Metz married British journalist Martyn Eaden in a Santa Barbara, California court house ceremony. They separated in January 2013, and Eaden filed for divorce from Metz in November 2014, citing "irreconcilable differences". On December 11, 2015, their divorce was finalized. 2005 Entourage Counter Girl Episode: "The Sundance Kids"
2005 All Of Us Ruby Episode: "If You Can't Stand the Heat"
2008 My Name Is Earl Chunk Episode: "We've Got Spirit"
2010 Huge Shoshanna Episode: "Talent Night"
2017 Drop the Mic Herself Episode: "David Arquette vs. Brian Tyree Henry / Jesse Tyler Ferguson vs. Chrissy Metz"
2018 The Last O.G. Pooh Cat Episode: "Repass"
^ a b c Radloff, Jessica. "'This Is Us' Star Chrissy Metz Talks Plus-Size Labels: "I'm So Much More Than the Weight I Carry on My Body."". Glamour. Retrieved January 25, 2017. [Metz] turned 36 on September 29, days after [This Is Us] aired its second episode ... Metz, a native of Homestead, Florida, spent her formative years in Japan (her dad was in the Navy) before moving back to Gainesville, Florida. ^ Watkins, Morgan (September 25, 2015). "At 6 months, Chrissy Metz's niece battles tall odds". The Gainesville Sun (Gainesville, Florida). ^ Meltzer, Marisa (March 6, 2017). "'This Is Us' Star Chrissy Metz Takes On the F Word". Marieclaire.com. Retrieved April 18, 2019. ^ Boardman, Madeline (September 14, 2016). "'This Is Us': Before They Were Stars". Entertainment Weekly. Retrieved September 22, 2016. ^ Cavassuto, Maria (September 14, 2016). "'This is Us' Actress Chrissy Metz on Her Plus-Sized Role: This is a 'Story That Needs to Be Told'". Variety. Retrieved September 22, 2016. ^ Maple, Taylor (October 3, 2017). "Videos Of Chrissy Metz Singing Before 'This Is Us' Reveal That Kate's Musical Future Couldn't Be In Better Hands". Bustle. Retrieved April 15, 2018. ^ N'Duka, Amanda (January 31, 2018). "'This Is Us' Star Chrissy Metz Set To Topline 'The Impossible' For Fox 2000". Deadline Hollywood. Retrieved March 6, 2018. ^ "A STEADY RAIN Extends After Sold-Out Hollywood Fringe Festival Run". BroadwayWorld.com. Retrieved April 18, 2019. ^ Roca, Teresa (February 14, 2017). "Car, Cash & Courtroom Snub: Inside 'This Is Us' Star Chrissy Metz's Dirty Divorce From Ex". Radar Online. ^ "How Chrissy Metz's 'First Real Love' Broke Her Heart In Secret Divorce". Radar Online. February 1, 2017. ^ Schwartz, Ryan (March 1, 2019). "This Is Us' Chrissy Metz to Guest-Star On Superstore as Cloud 9 HR Rep". Tvline.com. ^ Bradley, Laura (January 8, 2018). "Golden Globes 2018: See Laura Dern's Inspiring Acceptance Speech". Vanity Fair. Retrieved January 8, 2018. ^ Cohen, Rebecca (January 8, 2018). "Golden Globes: Laura Dern Wins Best Supporting Actress for 'Big Little Lies'". The Hollywood Reporter. Retrieved January 8, 2018. ^ McDermott, Daeve (January 8, 2018). "'Big Little Lies' stars Laura Dern, Nicole Kidman condemn abuse in Golden Globes speeches". USA Today. Retrieved January 8, 2018. 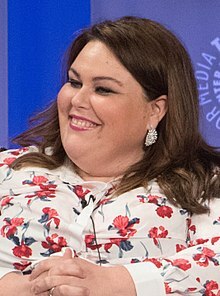 Wikimedia Commons has media related to Chrissy Metz.